MEXICO CITY (Reuters) - A trove of Aztec sacrifices including a richly adorned jaguar dressed as a warrior and recently discovered in downtown Mexico City could lead archaeologists to the most tantalizing find yet: an Aztec emperor's tomb. Discovered off the steps of the Aztec's holiest temple during the reign of the empire's most powerful ruler, the sacrificial offerings also include a young boy, dressed to resemble the Aztec war god and solar deity, and a set of flint knives elaborately decorated with mother of pearl and precious stones. 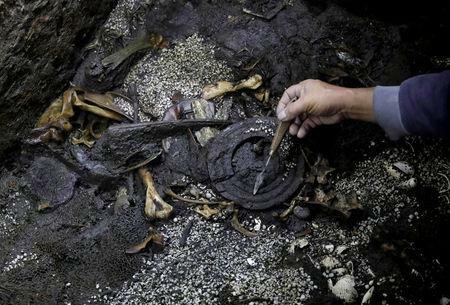 "We have enormous expectations right now," lead archeologist Leonardo Lopez Lujan told Reuters. "As we go deeper we think we'll continue finding very rich objects." Only about one-tenth of the box's contents has been excavated, but already a wide array of artifacts has been found near the top, including a spear thrower and a carved wooden disk placed on the feline's back that was the emblem of the Aztec patron deity Huitzilopochtli, the war and sun god. "There's an enormous amount of coral that's blocking what we can see below," said archeologist Miguel Baez, part of the team excavating the offerings at the base of the temple, known today as the Templo Mayor, located just off Mexico City's bustling Zocalo plaza. According to these accounts, the rulers' cremated remains were deposited with luxurious offerings and the hearts of sacrificed slaves in or near the circular platform. In 2006, a massive monolith of the Aztec earth goddess was discovered nearby with an inscription corresponding to the year 1502, which is when the empire's greatest ruler and the last of the brothers, Ahuitzotl, died. Elizabeth Boone, an ancient Mexico specialist at Tulane University, notes that Ahuitzotl's death would have been marked with lavish memorizing and that the jaguar may represent the king as a fearless warrior. "You could have Ahuitzotl in that box," she said. "The offerings provide a window not only into the (Aztecs) sacred world, but also their economic lives," said Frances Berdan, an Aztec scholar at California State University, San Bernardino. Mexico's new government has cut the project's budget by 20 percent this year, according to several archeologists who work on the excavation, and nearly all members of the 25-person team have not been paid since December.